During MSPO 2014, German Flensburger Fahrzeugbau company and Polish Defence Holding showcase the Wisent Armoured Recovery Vehicle (ARV), which is designed for recovery operations and technical support of heavy military vehicles during field operations as well as in maintenance workshops, especially to Leopard Main Battle Tanks. The Wisent Armoured Recovery Vehicle (ARV) is the perfect vehicle to perform all recovery missions with enough power and protection to ensure success. An innovative crane has been designed to lift loads in excess of 30 tons. The main winch has been greatly improved and the ARV is also equipped with an auxiliary winch which helps to pull the main winch cable into position or allows recovery missions of smaller vehicles. 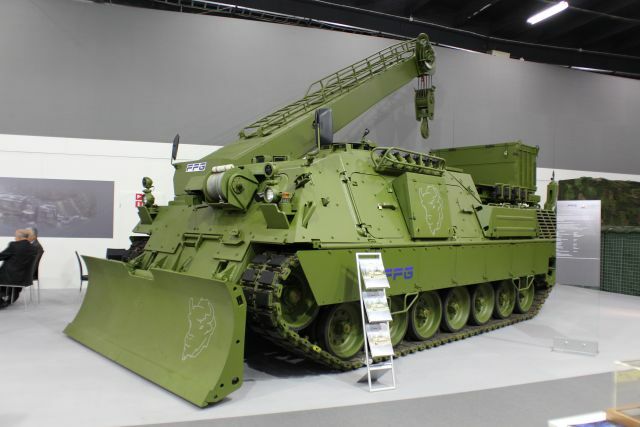 The Wisent 1 ARV can carry a spare Leopard 2 power pack stowed on top and has a total weight of approximately 54 tons. With its 960 hp, the Wisent ARV can achieve speeds of over 65 km/h. Combat recovering is enhanced by the adopted Combat Recovery System CRS® which allows the crew to recover vehicles under the full armour of the Wisent. To achieve a fast and safe recovery mission, the Combat Recovery System CRS® is equipped with a specialized camera system. FFG's Wisent boasts excellence performance data: the engine provides 960 hp and a top speed of 65 km/h. This means the Wisent can easily follow the tank corps even over difficult terrain. The NATO STANAG 4569 ballistic protection level 5 as well as level 3 protection against mines provide sufficient crew safety in conflict areas. To increase the crew protection, the Wisent ARV can also be provide with two 7.62 mm MG and a Smoke Grenade Launcher (SGL) system. The Wisent is designed as a vehicle platform and is also available as Amoured Engineering Vehicle (AEV- with mine clearing equipment.